This article first was published by WDDE.org, Delaware’s NPR News Station on November 25, 2012. Fox started studying sand tiger sharks in the Delaware Bay in 2006, in an effort to understand why their numbers have declined between 70 and 95 percent in recent years. This fall, thanks to some high tech support from researchers at the University of Delaware, Fox got his first real-time glimpse of the migration patterns and environmental preferences of these elusive sharks – information that may help him find answers to the shark’s dwindling presence. Continuing a longtime partnership between Delaware’s two land-grant universities, Fox called upon University of Delaware assistant professor of oceanography Matt Oliver to convert a remote-controlled underwater glider used to monitor water conditions into a satellite receiver and transmitter. Over the last six years, Fox has tagged more than 500 sand tiger sharks with acoustic transmitters that send radio signals to an array of 70 receivers positioned along the Atlantic coastline as the sharks swim by them. By combining data gathered through those acoustic transmitters with sightings reported by marine biologists in other coastal states, Fox has started to piece together an outline of the sand tiger shark’s migration habits. Mother sand tiger sharks seem to prefer to give birth off the coast of the Carolinas. Young pups spend their summers in Cape Cod before graduating to Delaware Bay, Fox said. Both young and adult sand tigers spend the winters in the warmer waters of Florida and the Gulf of Mexico. “One of the things we have been able to figure out is that the Delaware Bay probably has the largest concentrations of sand tiger sharks in the summer,” Fox said. The sand tiger sharks likely fill a vital ecological niche at the top of the bay’s food chain, Fox said. Should their numbers continue to decline, he said he worries that the ecosystem as a whole could suffer. This wouldn’t be the first time the declining shark populations rippled down to impact neighboring species, Fox said. The decline of sand bar sharks in the Chesapeake Bay led to an explosion of cownose rays that in turn decimated the bay’s oyster population, and fractured Maryland’s oyster industry. While Fox’s acoustic transmitters have provided a rough sketch of the sand tiger sharks’ migration path, many questions linger about what environmental cues might trigger migration and reproduction, Fox said. That’s where Oliver’s suped-up glider comes in. Oliver’s adaptation can also pick up signals given off by special Radio Frequency Identification (RFID) tags attached to marine animals, alter its course to follow those animals, and head to the surface to place a satellite telephone call to Oliver’s lab with information about which animals it has encountered and the corresponding environmental conditions. “The idea is to actually get the data that shows what types of water conditions sharks are using so that you can eventually build a model and make predictions based on water parameters,” Oliver said. University of Delaware graduate student of oceanography Danielle Haulsee also helped to broaden the kind of information available to Fox by internally implanting sand tiger sharks with VEMCO mobile transceivers (VMTs). These high-tech tags are capable of not only transmitting their location but also of receiving information from other VMTs implanted in other marine life, such as other sharks, striped bass, or sturgeon. “[I]f anything with a [VMT] tag swims by a shark, it can pick that up and tell us about it. By looking at the data that comes from those tags, you can start to see not only where the shark goes but what else is around that shark,” Haulsee said. Haulsee received special training from marine veterinarians from the Georgia Aquarium to surgically implant VMT tags into sand tiger sharks. This summer, she, Fox, and Oliver headed out into the bay fishing for sharks. The three drew sand tiger sharks alongside the boat, one at a time, in a kind of underwater stretcher that folds around the animal and holds it in place just under the surface of the water. Haulsee made a small incision in the abdomens of 20 sand tiger sharks, placing tags in the body cavity, before stitching them back up and sending them on their way. Fox hopes that gathering diverse data about sand tiger sharks from OTIS and the VMT tags could not only expand knowledge about sand tiger shark behaviors and habits, but also lead to the identification and reduction of factors that might be contributing to their decline. However, because sand tiger sharks have one of the lowest reproductive growth rates of all sharks, recovery likely will be slow. 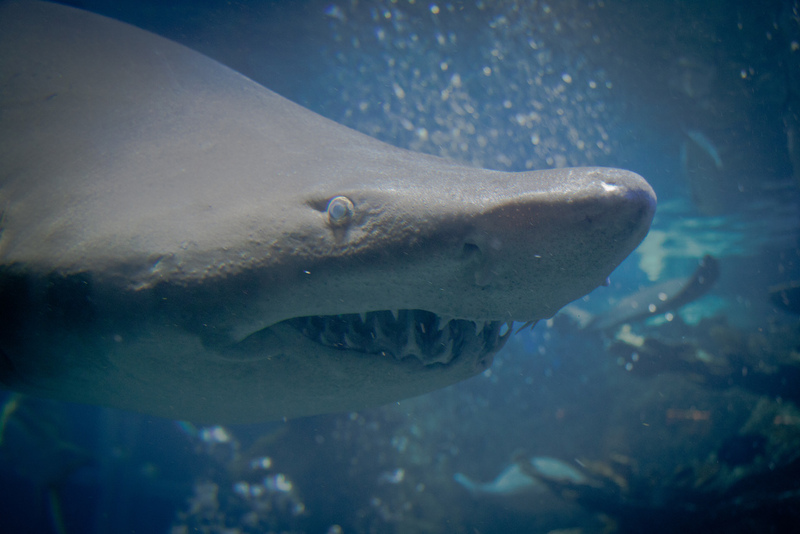 Female sand tiger sharks do not fully mature until their teens and typically only live until they are around 25 years old. Sand tiger embryos begin learning to hunt in the womb, first eating unfertilized eggs, and then their would-be siblings until only one remains. Females give birth to a single pup every two years or more. That means a single female probably will only have four pups in her lifetime. “This is an animal that even if everything is right, it’s going to take a long time for them to come back,” Fox said.